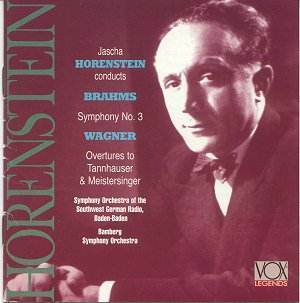 The Brahms Third Symphony is a stereo recording from 1958 which was late in Horenstein's activities for Vox. Generally it is very well balanced for the period with only the top frequencies all out betraying real age. Though, as with all these Horenstein re-issues, audiophiles will find them a little "rusty" when compared with more recent recordings. For others, of course, the music making will carry the day. The symphony opens with energy and power and even in the lyrical second subject material Horenstein keeps a firm hand on proceedings paying special attention to the pizzicato accompaniments. No exposition repeat is observed, which is a pity in so short a movement, so this gives added momentum to Horenstein's breezy, open-air quality in the development which gets a seamless run into the recapitulation where Horenstein's subtle control pays greatest dividends. In the second movement I found Horenstein's more Central European sound most arresting. There is an undoubted hint of Dvorak in the sound here that is not often noted. But it's in the third movement where the recording scores its most notable point. Here Horenstein seems to shift the whole emotional weight of the work to this movement. The darker colours of the music are stressed and the tempo is deliberate, though it never drags. It is with touches like these that Horenstein can so often throw light on to music that we think we know very well. I then found that the fourth movement seems to retain a little of the mood of what precedes it. Horenstein maintains the symphonic line admirably at what under other interpreters might be too deliberate a tempo. A fascinating reading of Brahms's autumnal work, therefore, which it is good to see back in the catalogue. The two Wagner Overtures that complete this disc should remind us that Horenstein was as much at home in the opera pit. In fact it was Parsifal at Covent Garden that turned out to be his final conducting assignment. The Meistersinger Act I Prelude is grand and suitably bourgeois at the start but it's the central sections - the love music and the apprentices - that really delight. The latter are given a light touch against that familiar Vox resonance that brings back memories of the old LPs, and the former glows with great ardour. The Tannhauser Overture is the version that reprises the opening material rather than runs into the extended Venusberg music. Nevertheless, Horenstein catches all the moods, even lifting it above that of an opera Prelude and into the territory of symphonic poem. The Venusberg material that remains in the middle comes over with the right degree of sensuousness and dazzle. Both overtures are given warm and detailed mono sound that allows the Bamberg Orchestra to shine.